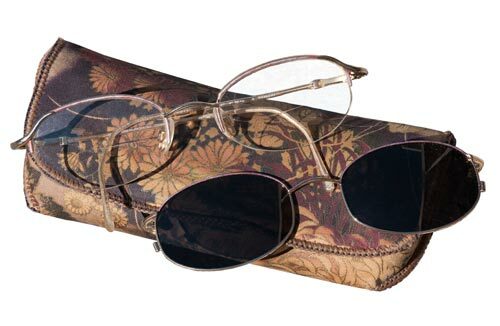 Back when I was beginning to go blind (early stages - see this article) I began choosing books from the "large print" section of our local library. Compared to the vast number of regular size print books, this section was still fairly small back then. It didn't take me long to read all the books available in genre I enjoyed (mystery, horror, some sci-fi, thrillers). 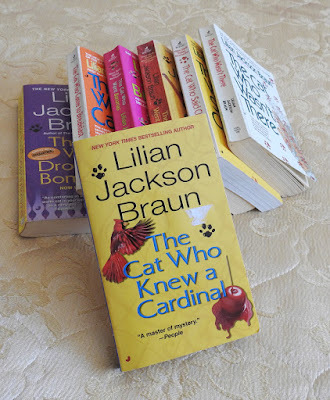 Pretty soon I was pouring over the other offerings looking at what else I might read ... something out of my general reading habits because that's what was left in large print and I happened upon the series of "The Cat Who ..." books by author Lilian Jackson Braun. And oh my goodness ... did I read! I quickly gobbled up the first three books I'd grabbed, and hurried back to the library for more. Although these are what I consider a light relaxing read, I found them sort of cute and fun ... just some easy to read tales, but I think the thing that probably got me hooked very quickly were the characters. That's one of the things I like about her books ... when you reach the end of the book, you feel as though you've become "friends" with the main characters of the book and find your self wondering what happens to them next. That's how I felt after reading the first one ... by the time I'd finished the third one, the recurring main characters seemed very much like real people, and not just names on a paper. Jim Qwilleran, his never-to-marry-but-always-date girlfriend Polly, and of course ... the cats: Koko and Yum-Yum, Arch Riker, the Lanspeaks, Amanda Goodwinter, Bushy the photographer ... and enough recurring characters to fill a small town. The "stars" of course, you get to know well, but all the other names that occur in more than one book are well enough remembered by the reader to become familiar with the town's inhabitants. The only thing missing is a map, which I'd love to have seen. The "Cat Who" series has 29 books, which is pretty long for a book series. Her last book (ostensibly her worst, though I haven't read it yet because I haven't FOUND it yet) was unfinished, and reviews of the book indicate that it just doesn't feel like one of hers. If I had to guess, I'd say that's not surprising given her advanced age when she wrote it (94, I think). The other thing you have to wonder is why her editor published it. Yes, the clamouring hoards of fans wanted more ... but what they wanted was more of her usual, not what they ended up getting. At the least, the editor could have suggested she get someone to assist her with that last book. At any rate, regardless of the reviews, I will continue hunting for the last book (The Cat Who had 60 Whiskers) and read it for myself. I suspect it may not fulfill my desire for more of Yum-Yum, Koko and "Qwill", but the series will be forever incomplete until I get the last one. Sadly, Lilian Jackson Braun passed away at the age of 97 in June of 2011. Her book series began way back in 1966 (The Cat Who Could Read Backwards), and ended in 2007 (The Cat Who had 60 Whiskers). For a full listing of books in the order they were published see The Order of Books. I recently ran across a couple of these books at book sales, and snapped them up ... I'm building my own library again (sold it all off once when we were moving and my book collection was too extensive to move) and The Cat Who books are ones I want in my collection. I'm focusing my efforts on only building a library of books I like to read ... over and over, and authors I really enjoy. To me re-readable books are much like a good movie ... often, once is not enough!